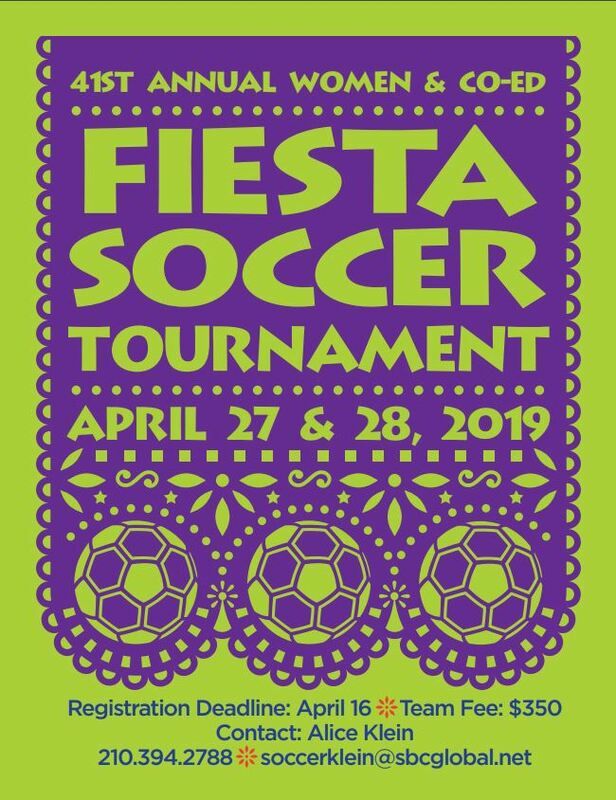 Registration fee will be $70.00 first team/$35.00 second team. Players need a picture for your player card. To register: Call Alice (210-394-2788) or email her. NOTE: Women and Co-ed teams may register only 2 multiple players. Exception: Women on Co-ed teams. Games will be 30-minute halves (5 minute halftime). Finals will be 45 min. halves (10 minute halftime), unless both team captains agree to play 30-minute halves. Bring to check in: 6 copies of your roster, player cards and/or driver license, waiver form, and travel permit if not affiliated with TSSAS. A player not registered with an affiliated association, may pay $10.00 for a tournament pass. Show driver license.  Players may play with 1 women team, 1 O45 team, if there is an O45 division & 1 co-ed team only.  Each team may carry 5 guest players. In certain cases, the tournament director may allow more than 5 guest players.  No jewelry is allowed.  Shirts must have a #. Except the goalie.  If a team does not have alternate jerseys, pennies are allowed, but the shirt underneath must have a #.  A player must wear the appropriate soccer attire.  Shin guards are mandatory.  A red carded coach or player must sit out the following game of the tournament and pay a $20.00 fine.  Winning team or team that ties must turn in game card to person posting scores. Make sure the referee writes the correct score on game card.  There is a 10-minute grace period before a game is a forfeit.  A team must have 7 players at game time.  If a final game ends in a tie, it will go straight to kicks from the mark.  First team listed is the home team and must change in case of a color conflict.  In the O45 division, players must be 45 years within the year of the tournament.  To start a game there must be 7 players including the goalie. A team can start game with 1 female, 5 males, and a goalie (male or female). A team may never have more than 5 males on the field, but there can be more than 5 females on the field.  If a male or female player gets red carded, the team must play 1 female or 1 male short. No player red carded may be replaced.  No slide tackles are allowed. However, the goalie may slide to get the ball.  Drop ball will be taken by 2 females.  Offensive goals: Men=1 point Women=2 points.  Maximum number of goals scored by any one male player is 2, for a total of 2 points.  No limit on goals scored by a female.  Penalty kicks may be taken by a female or male player. A female score counts as 2 points. A male score counts as 1 point.  Penalty kicks on overtime: female or male goal is 1 point.  There must be a minimum of 2 females of the 5 taking penalty kicks.  In case of a deflection: the last offensive player will determine the number of points, but if a player scores a goal on his/her own team, the goal will count as 1 point.  Maximum points attained per game is 10.  Forfeit win……………3 – 0 (6 points for a win, 1 point for shut out, 1 point for each goal)=10 points.  If a game is terminated at halftime, score at that time will stand.  Teams with fewest goals against advances (maximum 3 goals). Tournament may be delayed, cancelled, due to inclement weather. Team reps will receive check in mail for registration fees minus tournament expenses. WSA Board will have the final word in all disputes and decisions.